People in Asia these days try to stay indoors as much as possible to avoid the dangerous rays of sunlight which is one of the causes of skin cancer. What they do not realize is that sunlight is a natural energy needed by our body as they provide us with Vitamin D and most importantly in the healing world, it helps energize our chakras. With 7 main chakras in our body, and each relating to a body organ, the lack of sunlight therefore causes the colours of our chakras to dull and in turn leaves us feeling emotionally and physically imbalanced. To counter this dilemma, I would like to introduce to all my readers an indoor chakra energizer called the colour healing. It can take from as little as 5 minutes to as long as you want and can be done either standing or sitting. If you find it difficult to remember the sequence of the colours of your chakra, it will be useful to know that the colour of our 7 main chakras are the same as the colours of rainbow in the same sequence. next instructions when you are ready. 1) As you inhale, imagine the colour red coming up through your legs and when you exhale fill up your root chakra ( security centre ) with this energizing colour, giving you a vibrant feeling of security and confidence. Next, inhale again as you absorb the qualities that the red vibrations gives you, then exhale as you feel fear being dispelled down through your legs and into the ground. ( sensation centre ), then exhale to flood orange into your sacrum enlivening you even more after the red, bringing you joy. Inhale again to absorb more of the positive qualities then exhale to disperse sadness into the ground. ( power centre ), bring in power and will into yourself. It helps boost up confidence and low self esteem, promoting optimism. Other than that, it also encourages self-control. ( love centre ), creating love and compassion to yourself and your loved ones. When you exhale, remove hatred and revenge and bury these negative feelings into the ground. 5) Then comes blue for the throat chakra ( centre of communication and understanding ) a peaceful and relaxing colour which helps in uplifting your moods. It promotes calmness and understanding, allowing better self – expression. 6) Next, visualize indigo slowly enveloping your third eye chakra ( intuition centre).It’s connected to a person’s ability to think clearly, as well as their sense of imagination, intuition, wisdom, awareness to the world and insight that we all have to some degree. It helps us make decisions, and our ability to tell reality from fantasy. In other words, it helps one to be more trusting of their intuition. 7) Finally, let violet fill your crown chakra ( cosmic consciousness centre ), which is the symbol of purity and spirituality. It helps to balance the other 6 chakras and promotes freedom in three aspects of a human being: physical, emotional and spiritual. 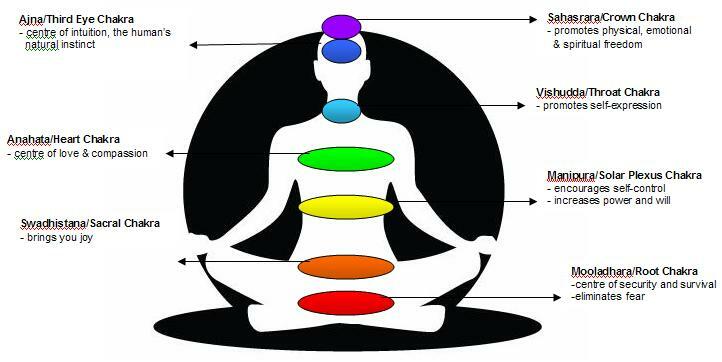 To end: Visualise all the 7 colors energizing your chakras again, from your root to the crown. Then inhale to bring in positiveness into your self and exhale to release all the negative feelings into the ground. To finish, mentally tell yourself that you are now feeling recharged and revitalized, and that you will have a positive day ahead no matter what comes your way. This method of colour healing need not be done as a whole. You can choose to energize only one particular chakra to achieve the effects you desire.Ie: focus on visualizing green in your heart chakra when you feel anger while filling your heart with love and compassion. No one person can tell you what is right for you. Not in a pose, not in a diet, not in your life. Every single body is unique, and only you can ever really know what is right for you. You can hear advice, seek out guidance, and even ask for help, but ultimately, it is you and you alone who knows what is best for you. 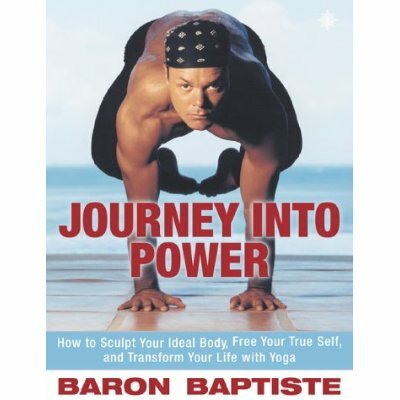 Enlightenment about your body, your mind, and your life is a very individual process. Teaching becomes problematic when we prescribe that there is only one way of doing something. It is said that the path to englihtenment is like a bird flying in the sky: It leaves no footprints behind. That is why traditions that claim theirs is the only way are absurd. Tradition is valuable for what it can teach us, but the minute it becomes absolute, it negates the most precious human resource there is: our intuition. One of the singular appeals of yoga is that it promises a definite technique by which we can make ourselves independent of preceptors, teachers, or gurus. But so often we are not shown that side of yoga in the West. We are given teachers, or “gurus” who establish themselves as divine intermediaries and claim to hold in their hands the key to our enlightenment. Traditional yoga often sends students the message that they must follow teachers or tradition to the letter, that they know nothing in comparison to the guru, that it is the teacher’s way or the highway. Believe me, I’ve been around the yoga world my whole life, and I’ve seen every angle of intimidation, humiliation, and blind devotion. Since I was a boy, I have witnessed many soul-searching people get swallowed up into the unthinking atmosphere that surrounds popular gurus. To this day, I’m stunned to see educated men or women blindly following a master. Regardless of what inconsistencies arise, they make excuses for the master, as though they have forfeited their powers of discernment and common sense. Many gurus control their followers through the brilliant process of contradiction. Do what they say, and they promise you will achieve enlightenment. The catch is that the tasks or problems they present you are altogether unsolvable. You become emotionally and spiritually absorbed in the problem, then are taught that you need the guru to guide you through such a big and confusing process. You doubt yourself and come to rely more on the guru, believing that he is the one with the answers. At one point in time, my life was guided in this fashion. I could not break away, because at that time I believed my guru possessed the only key to personal power. Whatever he said was right. If i didn’t understand something, it was because of some defect in me, not the master. I did the long hours of meditation, chores, asana practice, and endless study, all with small amounts of sleep. I was the true brainwashed yogi disciple. Eventually I woke up and and saw that I was only regurgitating what my teachers had told me. Without personal common sense and intuition, I realized, self-actualization was impossible. I could never really find the wisdom in myself if I only listened to what others were telling me. I later came to realize that the stakes in this kind of game is very high, and that people will do things in that state of mind they would normally not do; bending their bodies into positions that are ridiculous for their body type; memorizing sutras until their heads spin; or following diets, rules, vows, and techniques that make absolutely zero sense for what they are. If I sound a bit critical of gurus, I should clarify that the target of my criticism is the ignorance, hypocrisy, and downright spiritual dishonesty of many who profess to be gurus and masters in this ancient practice. The honest teachers are the ones who are willing to kick themselves off the pedestal and be real. People bow to an orange-robed master, and then find out one day that he’s not wearing any underwear. He may have amazing and wonderful things to teach us. But when you start thinking of him as holier than thou, you are falling into a trap. My father told me, ” Don’t be too fast to trust, but don’t automatically distrust,” and I think that’s the best advice anyone can give. Your intuiton is always right. ALWAYS. It is never wrong. And it is important that we get that. To the degree that I remember that, and listen to my intuition, my life flows and abundance pours in: the right people, the right guidance, the right circumstances. But when I ignore my intuition, I create a mess. The question is, when are you going to start trusting your intuitive power? Here on your yoga mat, start practicing intuition in action. Don’t follow me, or anyone else; follow yourself. If I tell you to do something and it doesn’t work for you, question it, modify it, play with it to make it work for you. I will push you, poke you, prod you, guide you, but it’s up to you to tune in and flow from what’s right for you. So dear readers, please re-evaluate your yoga practice and think real. You do not have to be a pretzel to do yoga, nor do you have to follow every single thing you are adviced to do by “gurus” for the Almighty never created everyone to be equal. Always pick and choose what you think makes sense to you, as long as you do not injure yourself physically and mentally.